An integrated hydrometeorological system was designed and implemented by HRC for the utilization of data from various sensors in the 3,300 km2 Panama Canal Watershed for the purpose of producing real-time, spatially distributed, mean areal rainfall estimates, and rainfall and flow forecasts. These forecasts are used by the ACP (Autoridad de Canal de Panama – Panama Canal Authority) for water management. The system ingests raw data from a 10-cm weather radar, automated rain gauges and surface meteorological stations, streamflow gauges, radiosonde upper air profilers, and analysis and forecast fields from the operational global numerical weather prediction model of the U.S. National Weather Service through the WRF mesoscale model implemented with high resolution (down to 2 km). State estimators utilize all available data for cloud, soil and channel model state updating and rainfall and flow forecast variance generation. Merged radar and rain gauge fields are produced in real time and are used to compute mean areal precipitation for each sub-catchment in the watershed. A user interface incorporates products useful for the forecaster and Canal manager. The system has been operational since 1998. Results of real time operation for several years show useful system forecasts during severe storm periods. HRC provides maintenance services to the ACP for this real-time hydrometeorological system. Using the components of this system, several studies have been undertaken by the HRC in collaboration with the ACP. 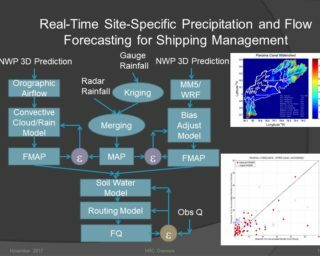 They include study of the evapotranspiration rates, heavy precipitation rate predictability, surface wind predictability, assessment of Panama Canal risks due to climatic variability and change and due to extreme events, and analysis of the impact of various Canal operating rules on benefits and costs due to shipping operations and flooding.